After personally attending a workshop of the Koelle Institute and experiencing the power of Equus Coaching, Kelley left the world of practicing traditional therapy and entered into the transformative work of Equus Coaching. 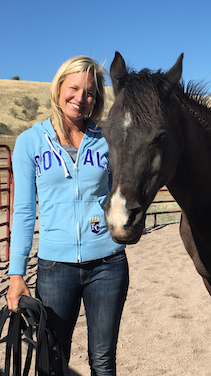 Kelley’s passion is helping clients step back into their bodies and watching them reawaken their inner desires through the wise feedback of their Equine guides. Kelley enjoys partnering with others on their journey back home to their authentic selves and observing them emerging into a joyful, richer and more colorful life. Kelley is a certified Equus Coach and also holds a Masters degree in Social Work from University of Missouri-Kansas City. She has trained as a Life Coach through the Martha Beck Institute.